Home » americans with disabilities act , civil war , confederate soldiers monument , discrimination , government , history , reidsville , reidsville city council , reidsville police department , rockingham county » 6 Inches of Freedom: City of Reidsville discriminating against disabled! Pro-Monument protestors given "ridiculous" amount of space! 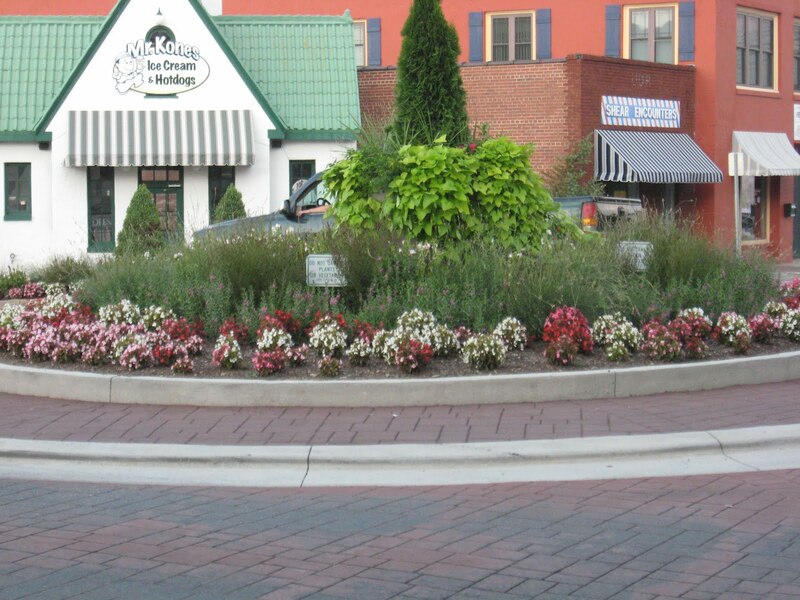 ADA violation could incur $$$ penalties! 6 Inches of Freedom: City of Reidsville discriminating against disabled! Pro-Monument protestors given "ridiculous" amount of space! ADA violation could incur $$$ penalties! The Police Department of the City of Reidsville has as of late last week implemented and begun enforcing a policy of limiting those protesting for the return of the Confederate Soldiers Monument to a six-inch wide raised enclosure surrounding the former site of the monument, The Knight Shift has learned. Those who do not limit themselves to this "area" will be arrested. This writer has attempted to contact Chief Edd Hunt to learn why. As of this evening I haven't heard from him or from anyone else in the police department. However one source did suggest that the policy came from "higher up". Obviously there is a question of whether this policy violates the First Amendment of the Constitution, in that it is restricting of the rights of free assembly, of free speech, and also of petition (in the form of protest). Because this policy is also apparently in violation of Title II of the American with Disabilities Act of 1990! A bit of refresher for those not up to speed (no pun intended). 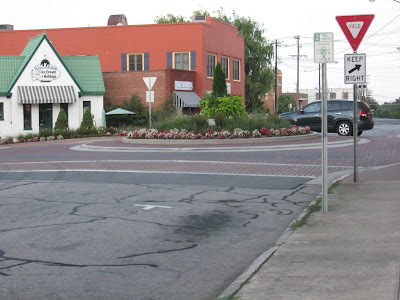 Early on the morning of May 23rd, 2011, the driver of a van crashed into the Confederate Soldiers Monument that had been standing at the intersection of Scales Street and Morehead Street in downtown Reidsville. The monument was erected in 1910 in honor and memory of those from Rockingham County who served in the Confederate army. 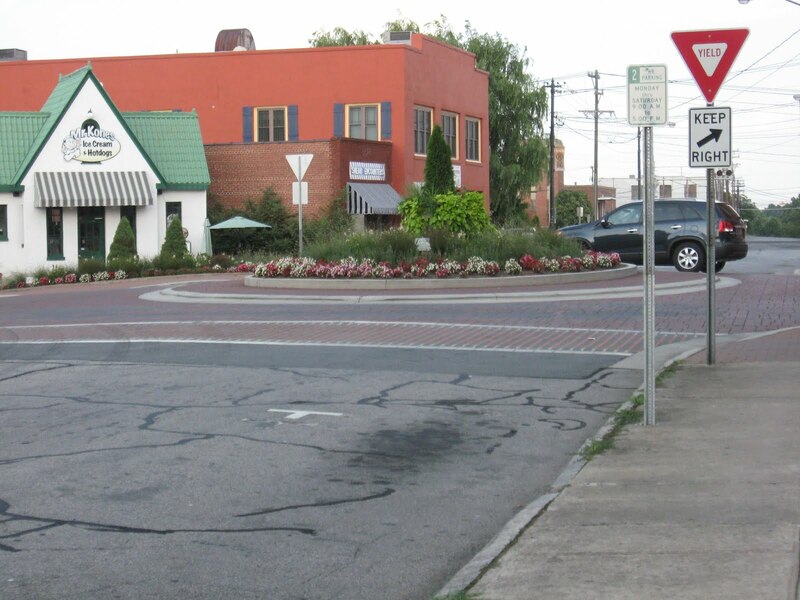 Now, you would think that the City of Reidsville - and its mayor, James Festerman - would have done the responsible thing, the right thing, by having the monument repaired and replaced with the insurance money. That's what's supposed to happen in a situation like that. But for the past year Mayor Festerman and the city council have done their absolute darndest to ignore this issue, hoping that it will simply "go away". 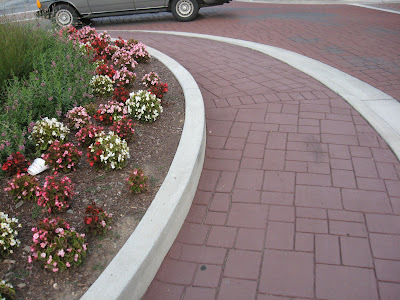 In place of the monument there is now a plum-ugly planter sitting in the center of what most still refer to as Monument Circle. That hasn't stopped many people - from all walks of life - from standing on the circle to protest the city government's negligence. The protests are still going on strong more than a year later. A group called the Historic Preservation Action Committee (HPAC) has formed to pursue legal action in order to restore the monument. But now it looks as if the City of Reidsville intends to wipe out peaceful demonstration in favor of the monument... or at least sparing it a half-foot of liberty. 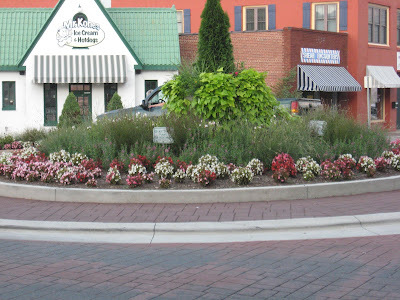 The Reidsville Police Department is as of last week warning individuals that they must stand on the concrete enclosure surrounding the flower bed at the center of Monument Circle, if they wish to protest at all. Failure to do so (i.e. 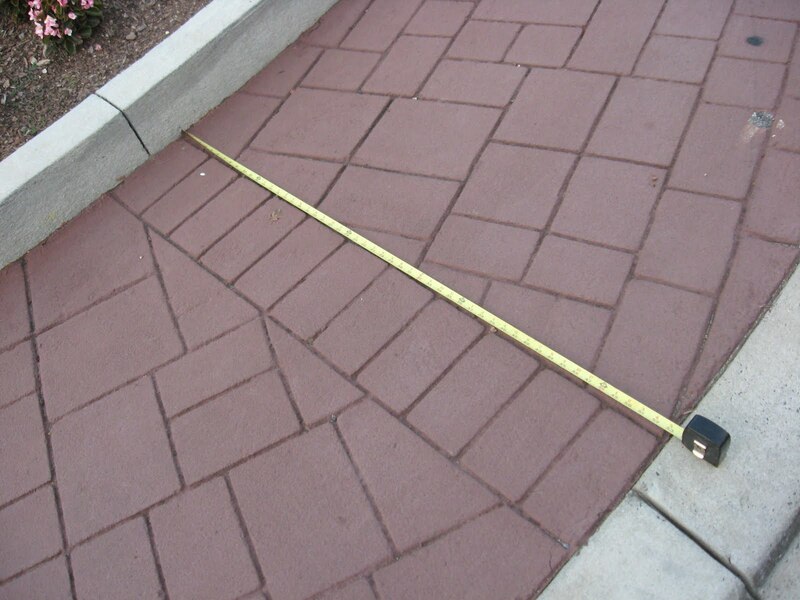 standing on the brick walkway) can and will result in arrest. As of this evening, no one in the Reidsville Police Department has been able to tell me what city statute this policy derives from. Six inches! Six measly inches in which those standing on the site petitioning for the monument's return must be restrained to, under threat of arrest. The enclosure is almost twice as high off the surrounding walkway. Why should anyone be given such an insanely tiny amount of public land - technically park land - in which to peaceably assemble and exercise their right of free speech? 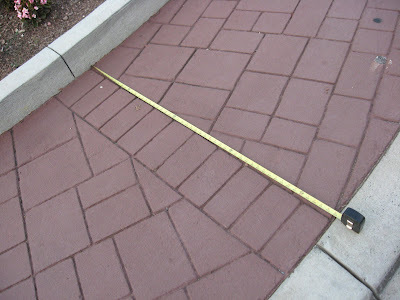 Especially when there's a whopping FIFTY-THREE INCHES of brick sidewalk on which they can safely stand? But in doing this the City of Reidsville is also - as best as I can tell - in gross violation of the Americans with Disabilities Act of 1990. Specifically, Title II of the ADA, which pertains to discrimination on the basis of disability by state and local governments. Six inches of "free speech zone"? Deviation from which will result in arrest? Because I cannot for the life of me figure out how a person whose mobility is limited to a wheelchair, or a motorized scooter, or even one who must employ crutches or some other aid, can protest under such a ludicrous policy and not be arrested. For nothing more or less than the obligations demanded by their individual circumstance. 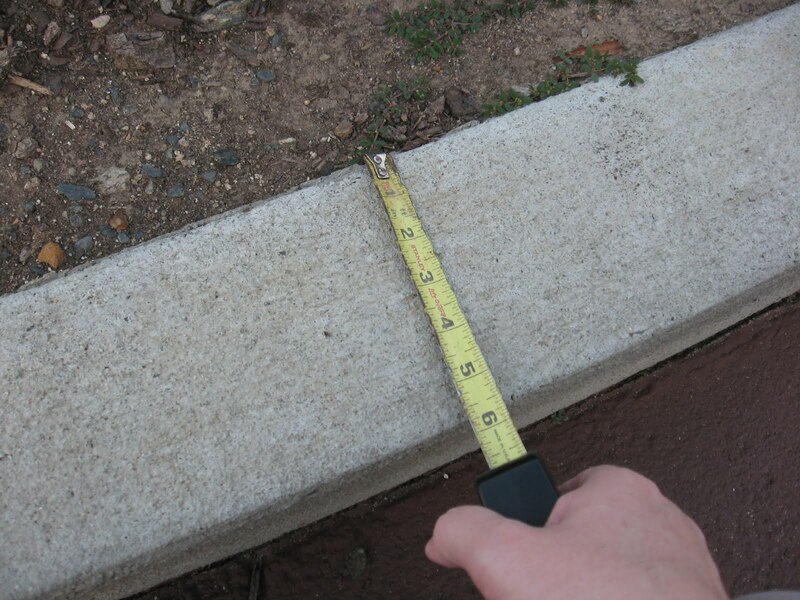 If the City of Reidsville insists upon limiting protest to those six inches of cement, then per the ADA it has the legal obligation to construct equal access to those with disabilities. Ever seen a wheelchair ramp leading up to a six-inch wide strip of concrete? Me neither. But I can see this much: the City of Reidsville is discriminating against disabled individuals on top of some possibly egregious violation of constitutional rights. And for actively violating the Americans with Disabilities Act, that alone could make the City of Reidsville liable for $50,000 in penalties. Perhaps even as high as $100,000. Maybe even a lot more, if it's found that the city government is committing multiple violations of the ADA. ...is it really worth trying to shut up the majority of public opinion about the Confederate Soldiers Monument with six inches of free speech? Is this attempt at political correctness honestly worth possibly losing a hundred thousand dollars of money that Reidsville doesn't have? Freedom measured with a tape measure is an insult to the founders. This policy is asinine and should be challenged in any way necessary. Is that all y'all got? Seriously? 6 inches? Come on, real men are much bigger than that. Try and stop a Flagging on a sidewalk.